Queen Mary 2 in Halifax. ​Meanwhile, MRCC (Maritime Rescue Coordination Center) United Kingdom Coast Guard, acting in coordination with the Canadian authorities, had sent a message to Queen Mary 2 asking whether she could assist in the rescue. The officer who received the message, immediately took it to Captain Wells. Naturally, the first impulse is to say of course, we will help but a reasoned decision weighing all the relevant factors was required. “Your first responsibility is to your own ship and your own passengers. So I will not do anything that will endanger this ship or my passengers or my crew.” After analyzing such things as the distance to Tamarind, the speed required to reach her and the weather forecast, Captain Wells determined that it would be feasible to help and ordered the ship to come about. 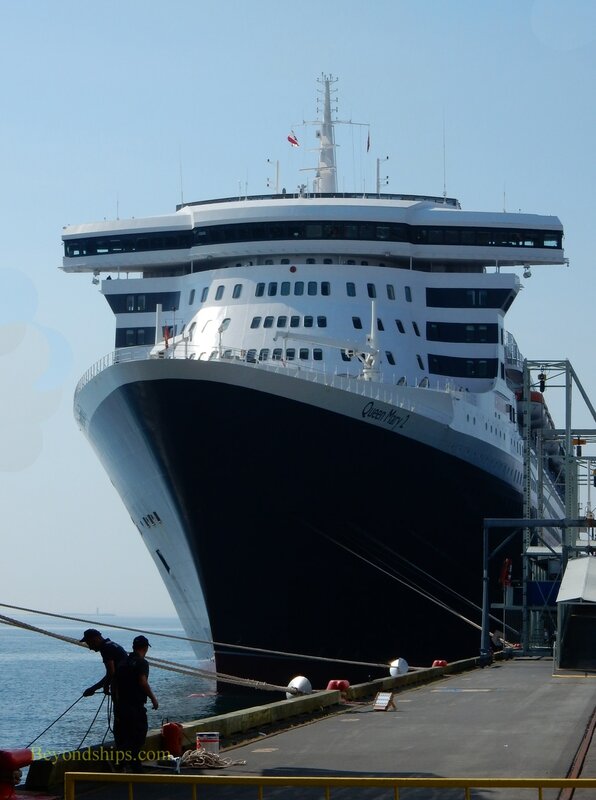 In order to get to the scene, Queen Mary 2 had to turn back and sail towards Europe about 200 miles. In addition, in order to arrive in a timely fashion, QM2 had to increase speed. The estimate was that it would take ten hours in these seas for QM2 to arrive. In the event, she made it there in nine hours. It was already daylight when the ocean liner arrived. Although the storm had moderated somewhat and bright patches appeared occasionally overhead, the winds were still strong and the swells still high. Indeed, the high waves hid the yacht from QM2's view. 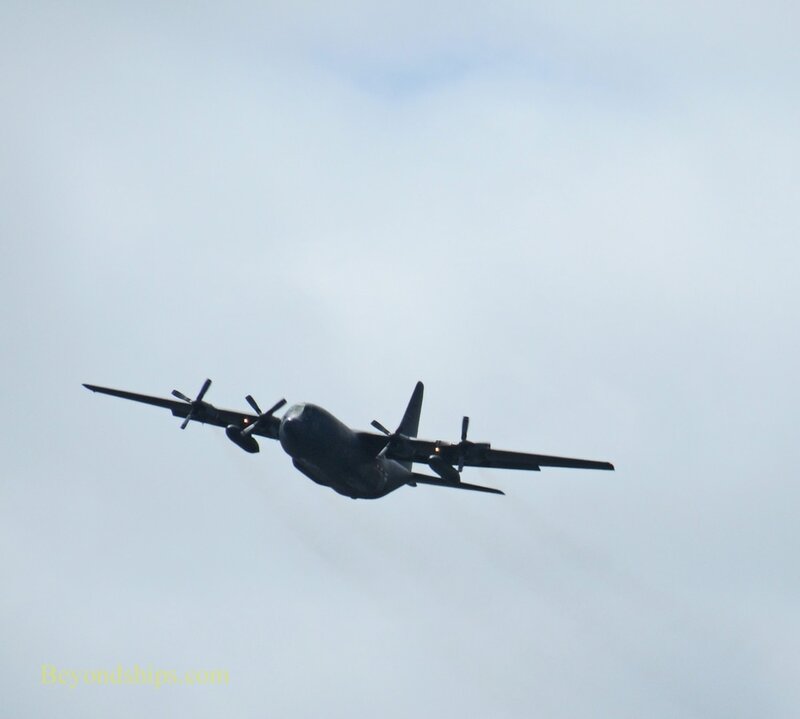 A Canadian C-130 Hercules aircraft guided QM2 to Tamarind. Inasmuch as the rescue area was far from land, a succession of aircraft had taken turns flying over Tamarind during the night. Indeed, when QM2 arrived, an RAF aircraft was en route to relieve the Canadians. Standing off in the haze was Labrador. The plan was similar to before. QM2 would come upwind of Tamarind, putting the yacht in the lee of the giant liner. Wheatley had envisioned himself entering QM2 through one of the shell doors in the side of the liner that are used when she is tendering passengers ashore in a port. However, Captain Wells vetoed this idea because opening one of the shell doors in such high seas would risk flooding QM2. Instead, QM2 would use one of her rescue boats to pick up Wheatley. QM2's rescue boast are small high speed craft. One each is stored among the lifeboats and tenders on either side of the ship. They are designed for use in man-overboard situations and other emergencies. The plan here was to lower one of the rescue boats down from Deck 7 to the sea. The boat would then go along side Tamarind and take Mr. Wheatley aboard. Then, Wheatley and the rescue boat would go back to QM2 and be raised up to Deck 7 where Wheatley and the boat crew would come aboard. 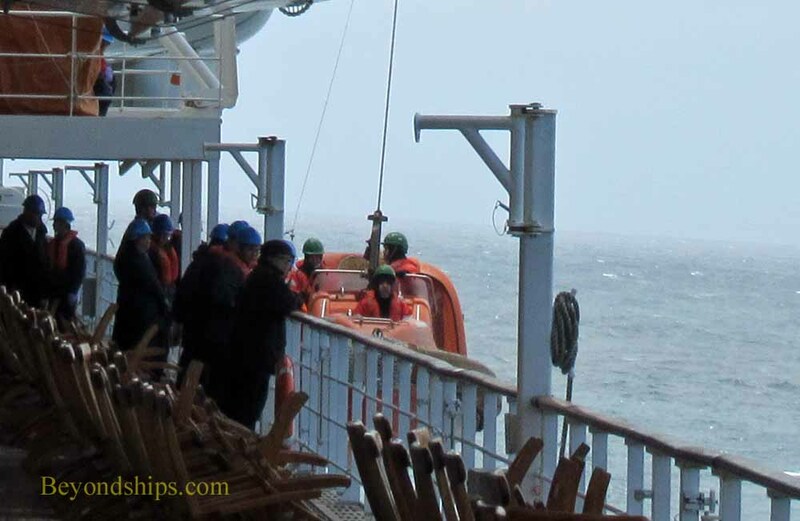 Launching and recovering the rescue boats is an operation that is practiced on a regular basis on QM2. However, such practices are done when the ship is in port in calm, sheltered waters. 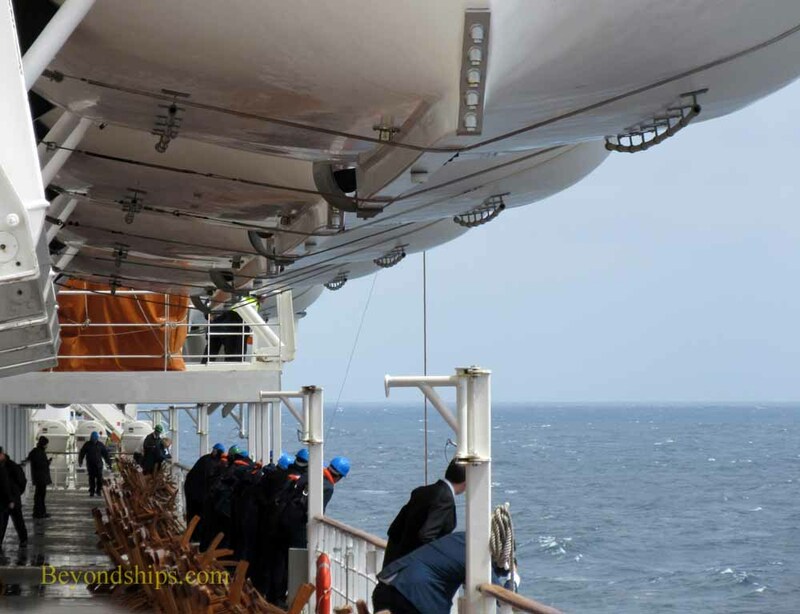 Here, the boat would be lowered and raised while the ship was rolling in strong winds. As it descended, the 27 meters (89 feet) to the sea, the crew would have to use poles to keep the boat from bouncing off the ship's side. Furthermore, the boat's only protection against the high seas once it was in the water would be the lee created by QM2. Therefore, the liner would have to stay close to the rescue boat. As QM2 approached, she slowed to a snail's pace. It is much more difficult to maneuver a large ship at slow speeds than it is when she is making good headway. In addition, a ship's stabilizers are only effective when the ship is moving and so the ship would become more subject to rolling. Furthermore, QM2's 13,000 square foot side acts like a giant sail prompting her to lean. To counteract this, Captain Wells shifted the water in the ship's ballast tanks to her windward side. ​Tamarind drifted along QM2's port side. 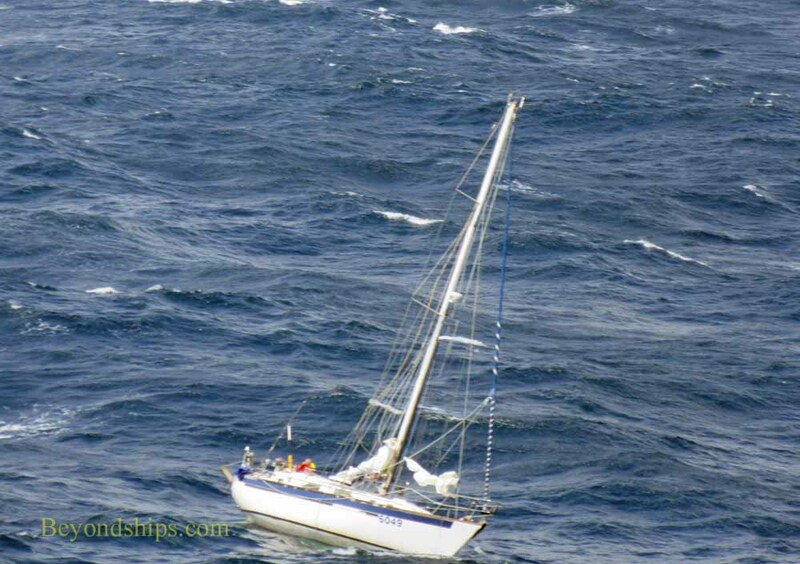 The yacht's mast beat against the side of the ship as the yacht rolled in the swells. She stopped drifting and came hard against the ship about two thirds of the way along the port side. 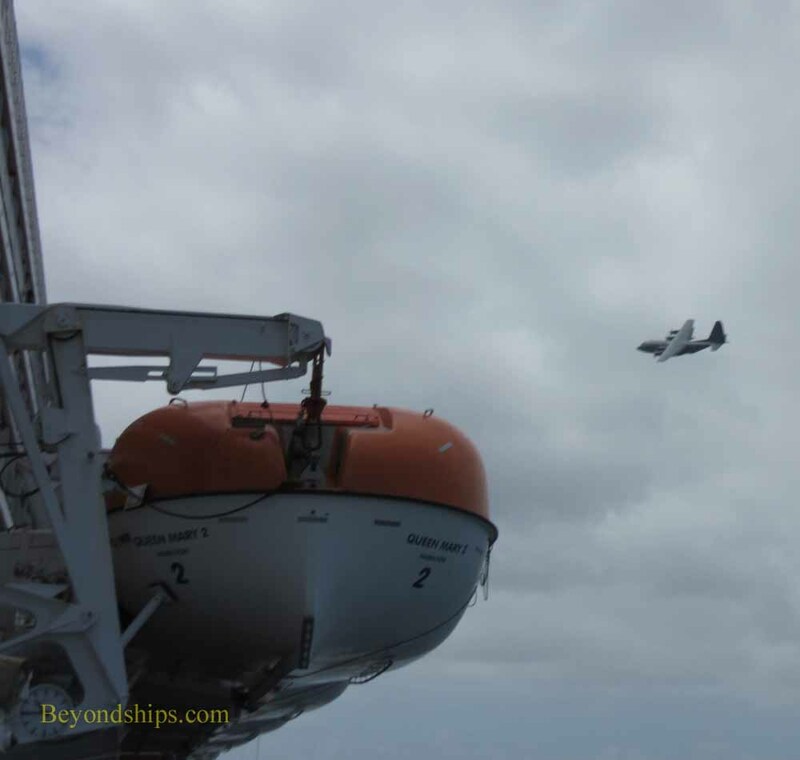 Above and below: A Canadian C-130 circles over QM2 coordinating the rescue. 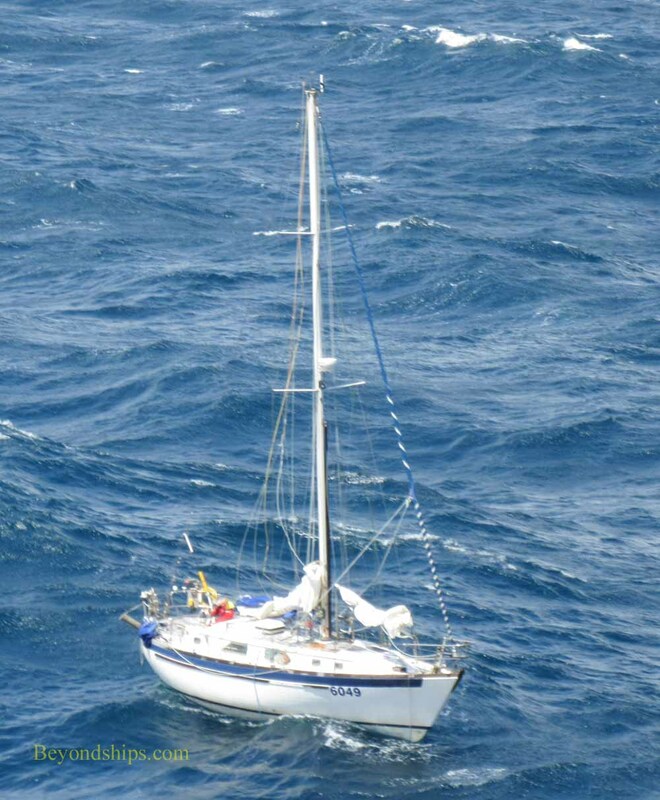 Above: The yacht Tamarind upright on top of a swell. ​Below: A moment later, Tamarind is nearly on her side. (See also video clip below). Above: Preparing to launch the rescue boat. ​Below: Crew members watch as the rescue boat is lowered some 90 feet to the sea.